So I've got 30 posts now, so I figured it would be best to start a build thread. I don't expect this to be some earth-shattering original build - but from experience - a thread like this will help me keep track of what's been done, what's planned etc etc. 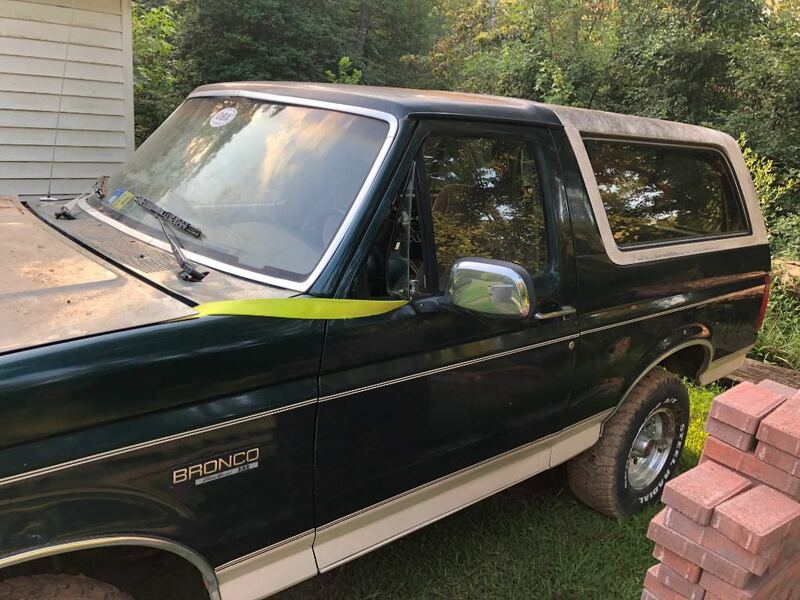 My first Bronco acquisition was a '96 XL. It sat in the owner's yard for over 2 years. They were "99% sure" it was the starter. Apparently he drove it to work on morning, it was fine. Went to drive home, and it wouldn't start. They tried a new battery. Nothing. Had it towed and it sat. 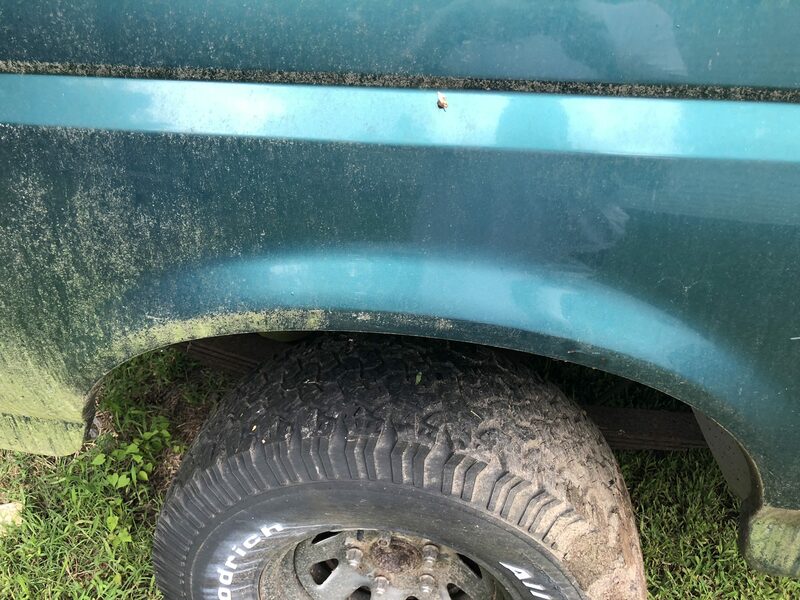 As you can see, there is ZERO wheel well rot - which seems to affect just about EVERY Bronco I've run across here in VA. Interior is even complete and actually in really good shape. No cracks in dash etc. Passenger seat was mint under a cheap seat cover and the driver's seat has a bit of wear. The truck does have some damage though. The story I got - true or not - is that the previous owner (which after running a Car Fax tells me he was the original owner truck was from TX) was towing a trailer and the trailer kicked around and either hit the truck or the truck drug up against something. The only spot of rot at all is because of this impact - which happened over 5 years ago - down at the very bottom of the driver's rear 1/4. Small spot a few inches in diameter. After swapping in a new battery - turns out the solenoid was bad. Jumping it off with a screwdriver caused it to actually fire up and run. I threw in some Stabil to deal with the old gas, but surprisingly the thing runs pretty well - especially for sitting for so long. Bonus - truck has a legit 120K on it. So the plan was to start gathering parts and start going through the truck. Fairly local to me. Zero rust. Also the only body damage is two dings in the front LH fender and a few scratches. I scored it - clean title just like the '96 - for a pretty good price too. Again, super clean wheel wells. Story on this truck was pretty simple. Current owner (had several project Fords at this place) bought it to swap an engine into. Previous owner had it in a barn. Engine went bad, they pulled the engine and were going to replace it. It sat. Undercarriage of this one is actually cleaner than the '96. Interior is dirty but surprisingly in GREAT shape. Power buckets aren't even ripped. Does need the armrests fixed though. When I called him he had several offers, no one had showed up with the cash. Drove there that night, looked it over, handed him the cash and got the title. Showed up two days later with my buddy's F150 and a Uhaul car trailer (my '84 GMC was down with a busted rear brake line). So of course no engine, my son was wondering how we were going to get it ont he trailer. I decided to go old school. Backed trailer up to the Bronco and lined the ramps up. Unhooked trailer, tied a tow strap to the F150 and the front crossmember of the Bronco and pulled it up on the trailer. Haven't tried this in years, and it worked a lot easier than I remember. Maybe 3 miles from where the Bronco was, one of the trailer tires decided to blow out. Luckily these were backroads and I was going maybe 30mph when it went. Luckily found a large pull off, called UHaul and waited. Hour and half and one new tire / wheel later, we were on our way again. @ 60 mile trip to the house was uneventful. The '96 will donate it's 302, E4OD, manual transfer case and linkage. The '93 is also missing the radiator / core support, the starting wiring harness / ground harness and the main harness that screws into the junction block under the hood. I plan to hit some local junkyard this weekend or next to see if I can rob a F150 of the needed wiring harnesses and hopefully the radiator / core support and hardware. I have the upper intake from the '93 along with what looks to be the complete '93 air intake and associated sensors. I am in the midst of moving into a new place - that has a 2 car detached garage and a 2 car detached shop. There are several house projects that must take priority so likely much won't get done unless it's after dark in the shop or on rainy days etc. At least for the next few weeks - still gotta get my old house on the market and sold too. Need to "unfreeze" the transfer case linkage on the '96 to make sure that's good to go. Haven't had a chance to crawl under there - I'm thinking it's just from not being used and sitting. One of the manual hubs won't turn either. Once that's squared away - yank the '96 engine, trans and transfer case. Get the 302 on the stand and start cleaning it up / replacing needed parts / gaskets etc. I'm leaning towards a compression test before I yank it. May have gotten lucky. 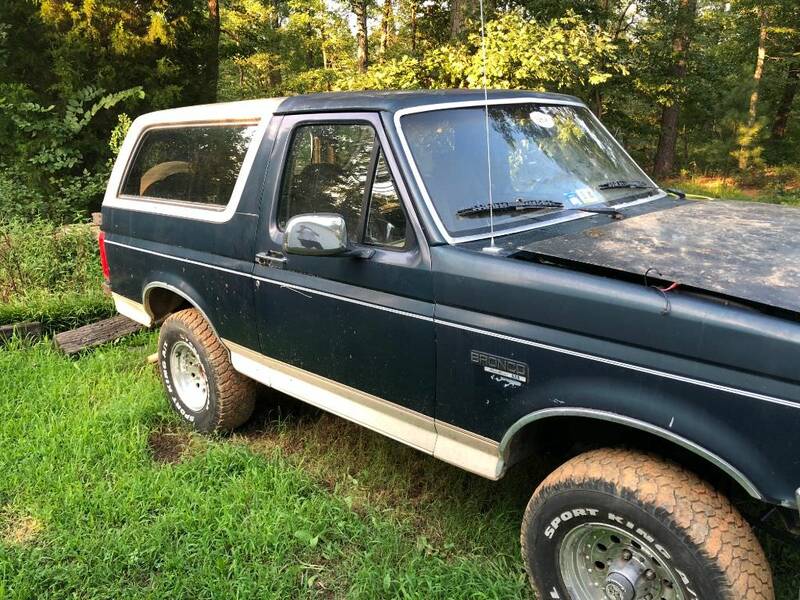 About an hour from me, a guy is parting out a '93 EB 302 Bronco. Running but wrecked. All wiring harnesses intact. Doing my best to get out there this weekend and pull everything I can. Like I'm mentioned before....in the process of getting moved into a new place. TON of house projects going on, not to mention getting all my tools and other stuff moved out of my old garage / house and getting that ready to put on the market. Long story not so long? I simply don't have time to drive 1.5 hours to pull parts when the guy isn't available that often. Ended up making an offer on a COMPLETE underhood harness (absolutely everything) from 93 EB 5.0 Bronco on Ebay. Cost a bit more than I was planning, but it has everything and it's uncut and unmodified and it will give me a fresh start to know what's wired to what etc. Worth it in my case. So that's on the way. Hoping to get a break in house projects - or just wait until late at night - and get the '96 pulled in the shop and see if I can free up the manual transfer case linkage and verify that works. Kinda tough when the only brake is the e brake. It can't be too easy, right? Harness is on the way. Almost to the point with house projects I can clean the '93 up and go ahead and push it into the shop and replace the brakes lines and go over the suspension / bearings / brakes etc. So I'd emailed a very highly recommended guy who does work on a ton of E4OD transmissions. I was inquiring about recommendations on what, if any, updates / mods I should do to the '96 E4OD while I've got it out. When I mentioned swapping the '96 E4OD into the '93 chassis, he said I didn't need to swap to the '93 solenoid packs, I could just modify the pin outs on the solenoid pack connectors and the MLP Sensor. I've asked for clarification, since the info I was given on this site, including documentation, states that the 95-96 E4OD moved the EPC protections diodes to the ECM where as on the '93 they are in the solenoid packs themselves. Also, doing a bunch of searches on this and other forums, ran across a thread that showed the FSB Bronco has a removable trans tunnel cover. That's nice to know, especially when I'm getting ready to pull the '96 in and start surgery. Also - I've done a ton of searches - any tips on why the manual transfer case linkage in the '96 wouldn't work? It was sitting for over 2 years - and I didn't want to force the shifter. (it won't come out of 2WD). One of the manual hubs is frozen - again likely from non-use and sitting, but that shouldn't effect engaging 4WD with the transfer case. I figure I'll crawl under and take a gander at the linkage and see if it's binding or just needs some 'persuading' to get moving. Still no "real" updates. Got the replacement '93 complete underhood harness in. Still moving shop tools and stuff from my old house to the new shop. Got my compressor moved in to the new shop, gotta rewire it for 220 and pick up a cord for it. Only thing left to grab with my trailer is my cherry picker and my engine stand and the 10 years worth of bolts, hardware and misc tools stored all in my garage. I think I have decided that I'm going to pull the drivetrain from the '96 first (engine, trans, driveshafts, transfer case etc) and then go ahead and address the few body issues on the '93 and paint it. So much easier with it mostly apart (front core support out etc). Then go from there. Hope to test fit or at least use the new harness enough to see if the tailgate window works on the '93. So the '93 will get a lift kit. It's not going to be a heavy duty off roader, so at this point the 6" Rough Country lift will be fine. That being said, I know they use drop brackets for the radius arms. I only like to take stuff apart once. So I'm going to replace the radius arm bushings at the same time everything is apart. Are the polyurethane bushings worth it? I figured I'd do the axle pivot bushings as well. What's the consensus on these? Poly? No? Doesn't matter? i'm still a little confused by this whole thing. if the 96 is an option, why not swap the good interior into the 96? i get that it needs some body work. i guess being a 302 contributes since the 93 would already have MAF. but having the OBD2 is pretty nice. what do you plan to do with the 96 once you take out the engine? could you install a JY engine and sell it as a running vehicle? If the 96 is running I would just repair the rear panel. A million times faster. 96 trans doesn’t play well with 93 computer/wiring harness. Just fyi. 96 are way more desirable and hold their value more also. Especially with only 120k miles on it. While I've never done a Bronco, I've done my share of other vehicles. The body on the '93 is in ridiculously good shape. The 1/4 on the '96 is at the point where it would be less time to replace it than try to massage it in shape. I will scavenge any bits and pieces from the '96 I need for the '93. 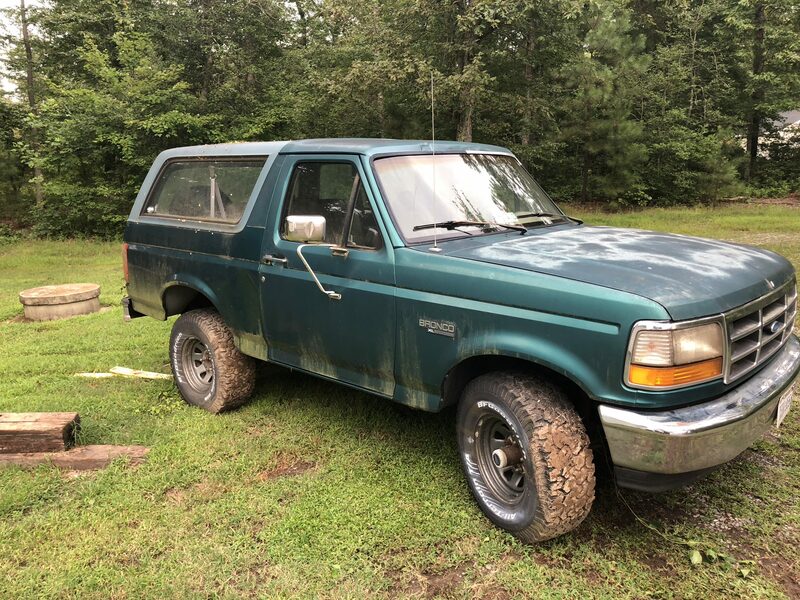 After the '93 is done, I will likely sell the '96 with a clean title as a good deal on a start to a rust free project for someone or rust free parts. Actually no - not a million times faster. I've done my share of paint and body work but more importantly I know several guys who do it for a living. They wouldn't even attempt to repair the 1/4 on the '96 because of the time involved. Could I massage it and get it looking pretty good? Yes. Could I prep and paint the '93 in the time it would take to fix the '96 1/4 panel? Yes. The '93 is that straight. I will use the '96 transmission in the '93 and use the solenoid packs and possibly MLPS from the '93 transmission. Cool build always nice seeing clean one going together over in the Rust belt region. I do not really have an opinion on which way is easier, I think what your doing is just fine. My only thought is a set of glass rear fenders would basically fix the rear quarter panel on the 96, though you'd still have to fix the b-pillar. This is what I would do if I was the person which ended up with your frame and tub. The B pillar is the time killer. The '96 is a rust free rig - but the frame / undercarriage is crusty. Not rotted etc - just in need of clean up. I've climbed under and over both rigs. The '93 will just take less time. Right now I haven't decided whether I'm going to prep and paint the '93 while it's apart (my son and I both want to do a single stage urethane matte / flat black) or what until after the running gear swap. With the core support already out of the '93 it makes a lot of things much easier to do now. Hope to finish up house project in the new few weeks and actually get some shop time on the project. Still need to grab my engine stand and cherry picker from my other garage and the rest of my tools. You never realize how much crap you accumulate in 11 years. I'm finding tools / parts in my old garage I'd completely forgotten about LOL - case in point I recently had to redo the rear brakes on my kid's '11 Silverado. Apparently the PO had left the E-Brake on and drove....front shoes were toasted. So I couldn't find my brake spring plier set. Started cleaning the garage out the next week - and founds two sets LOL. Paint decision not withstanding - the plan is to yank the engine / trans / transfer case and linkage from the '96, then roll it out of the shop and start going through the drive train. Engine runs surprisingly good, so it's likely just going to get a new seals / gaskets / timing chain, clean / rebuild the fuel injectors etc. Clean up the trans and swap in the '93 solenoid packs and MLPS if needed. At that point I'll roll the '93 in the shop and decide whether or not to start paint work or start going through the suspension / steering / drive line etc. Having a "hot spare" gives me greater leeway when it comes to rebuilding / replacing parts. I know you have your mind set but if it were me I would just order a replacement body panel off of lmc for the 1/4 panel. I’ve cut panels off broncos before and it’s surprisingly easy with a cutoff wheel on a grinder. We usually cut them off the install fiberglass bedsides but replacing with the metal would be even easier. You are already planning on painting it. Only suggesting all this because 96 is actually worth that much more than a 93. And would hate to see a 96 junked just for the motor. Also, if you are putting a motor in why not put in a 5.8l. Much better motor. Way more power/torque and the motor itself is stronger design than the 5.0l. You would be able to sell the running 96 for far more than the cost of a 5.8 engine and trans for the 93. I've done 1/4 panel replacement. That's not the issue. The B Pillar needs work. Again, it's time vs effort vs result. Around here, the '96 isn't worth ANY more than the '93. In fact, here in VA, the '93 is worth more because of the options. 302 from the '96 runs great and low miles. I wouldn't spend a dime to upgrade a stock 5.0 to a stock 5.8. Not worth it. I've built more than my share of engines. If I was going to upgrade, I'd build the engine myself. Around here the Bronco market is not that strong. Before I found these two Bronco's, we looked at a '94 EB with 6" suspension, new tires / wheels, rebuilt engine / transmission, no rust. Needed some interior work (trim mainly), exhaust work, and a bunch of little stuff. Owner wanted $4800. Offered him $3500 cash. He flat turned me down. Last week he messaged me wanting to know if the offer was still good. This is going to be a daily driver for my son in college. He doesn't drive many miles at all - he's on the road as a Div I athlete a good part of the year, not to mention his year round schedule of classes / weight lifting / practice. It will tote him and his Kayak when he gets his fishing in - early Spring / Spring. It will be function over form. Don't want a truck he'd worry about scratching or messing up driving into fishing hole spots etc. In fact I'm considering doing a bedliner paint job at this point. I've already done the math. Replacing all gaskets / seals in engine, plus detail, paint engine and transmission + replacing all metal brake lines, rebuilding front and rear brakes COMPLETELY, replacing all steering components, all suspension bushings, finishing out interior, tires, wheels, lift kit + paint and materials, I'll be into this thing for around $5K not counting what I can recoup from selling / parting the '96. I hope to have this pushed out of the shop and done by the first of the year. Right now new house projects / listing / fixing up old house is eating all my time. My '84 GMC K1500 will be a full blown frame off. Only needs 1 rocker, 2 bed arches, but it's likely getting a LSx drivetrain. It's going to be a driver / workhorse. Finally able to take a breath from constant projects on the new house, maintenance on other vehicles, plus getting my old house ready to go on the market. That being said, the '96 will be getting moved into the shop to donate it's drive train hopefully in the next week or two. Maybe I shouldn't have typed that out - I might be jinxing myself. Regardless, I'm getting ready to order all the parts I need / want for the drive train while I've got it out and before it goes in the '93. 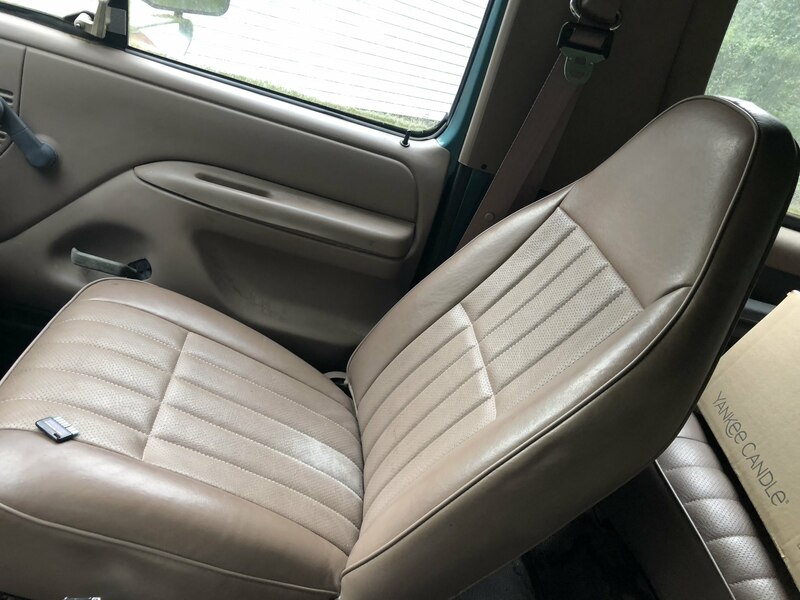 So the '96 Bronco 302 with 110K original miles (runs really good for having been sitting for several years LOL). Debating on installing a new torque converter or not. Any other recommendations before I start ordering parts? Yeah so if you never have to deal with selling a house - DON'T. After close to a year my old house if finally sold. It sucked up all my free time it seemed. Not to mention my GF and I dealing with two mortgage payments. 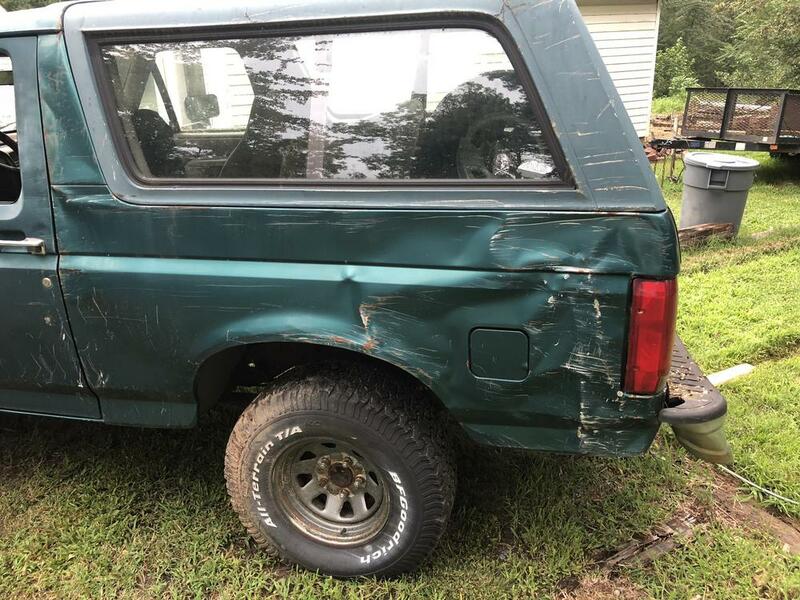 So I was getting ready to start an ordering frenzy on Rock Auto in preparation for yanking the drivetrain in the '96 Bronco when I get an email. 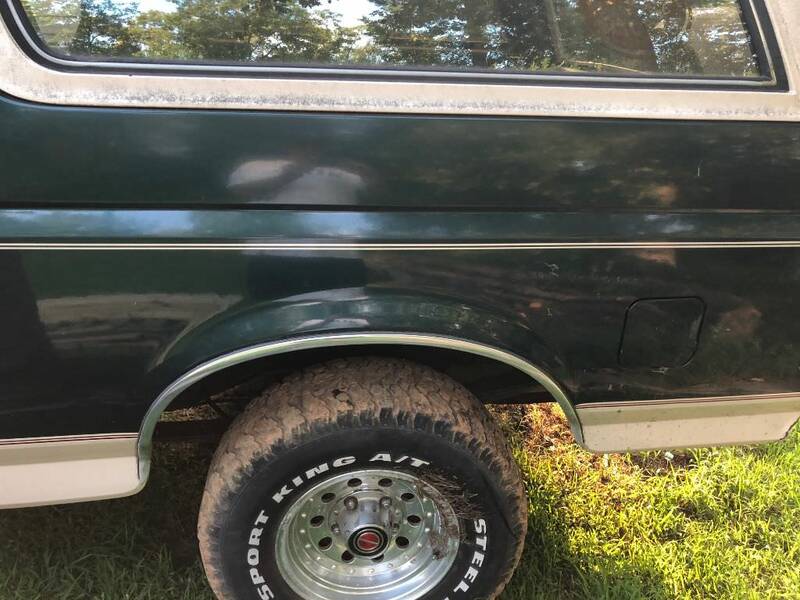 Apparently I forgot to stop this filter I had running for Craigslist list ads with certain key words / price range on Bronco's. Yeah - I bought another one. 1995 EB - No rust. Guy I bought it from was keeping it at his shop where he works (not the best part of town - especially after dark) and a while back someone decided they needed it more than he did. They broke the passenger window, and butchered the steering column, stole the face to the stereo - but couldn't manage to actually steal it. 6" lift. He just did all new shocks. 35" BFG's, M/T wheels. Interior is actually mint with both seats being power. Paperwork in a folder on the truck show where the previous owner paid over $5K in 2011 for a crate engine, and a rebuilt E4OD. Not to mention locker and gears. From the way it goes - I'm assuming they ditched the 3.55's for 4.56's - but won't know for sure until I get inside the pumpkins for a check and fluid change. The current owner just installed new Ball Joints, all new tie rods and steering linkage and new exhaust. I'm going to drop the steering column out of the '93 EB and install it in the '95. I don't care about losing the air bag. They are both tilt / cruise columns. The '93 will donate the passenger window and door panel. Also a previous owner rigged up a wire to run the tailgate window up and down LOL. I've got parts for that too. It's missing the spare tire holder - the 93 will donate here too. After that, I'll go through everything and then sell the '96 and '93. I'm tempted to install the new brake line on the '96, tune it up, get it road worthy and sell it as a driver. It might stay around - seems a found a line on a rust free, dent free Driver's quarter panel for the '96. I figure I got a good deal on the '95. I paid about what it would have cost to buy the 6" lift, tire and wheels I was going to install on the '93. CrazyBRONCOguy, cobrajoe, dash_cam and 1 others like this. I'm interested in this Craigslist alert. How'd you do that?